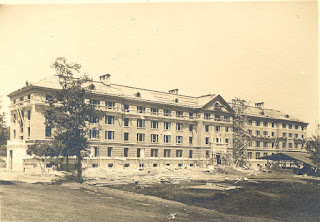 “New” Crossley Hall is one hundred five years old this month. In brief, here’s what the newspaper had to say about it. from The Hermonite, vol. XXV, no. 1; p. 11 (September 1911). The loss of old Crossley has been more than replaced by the new Crossley that graces our campus. The Crossley men [it became a coed building in 1974 –ed.] are to be congratulated on their new dormitory. Note: From blueprints to finished building, Crossley was constructed in less than nine months time. Here is an image from June 1911, showing construction progress. Happy 105th birthday, Crossley Hall!